And NESF has made it clear that it expects to follow up this acquisition with further storage asset purchases. 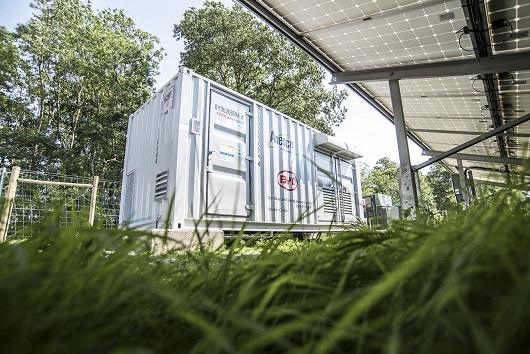 The fund has acquired the Salcey Farm and Pierces Farm solar assets, which have a combined capacity of 7.2MW, both of which have integrated, utility-scale battery storage facilities on-site. The batteries are both described as being lithium-ion in technology and installed alongside switchgear and transformers capable of enabling them to provide frequency response and grid balancing services. Revenue from those services will stack on top of the revenue streams provided by the 1.4 Renewables Obligation Certificates and feed-in tariff regimes the adjacent solar farms qualify for. In a statement to the market this morning, NESF further added that possible co-location of battery storage within its portfolio of 55 solar farms constituted a “very attractive opportunity” to enhance the value of its sites. Additional investments, NESF said, are expected to be made “in due course”. Battery storage has long been on NESF’s radar. The fund first made noises about the technology in its half-yearly report from December 2016, stating it was “exploring the feasibility” of investing in such facilities. “The investment manager remains fully engaged in monitoring technological change in the energy sector and is already exploring the feasibility of the application of energy storage facilities to the company's portfolio of solar PV plants. “Consequently, the company is well-positioned to incorporate the continuing innovation in energy technology and benefit from the associated incremental returns and/or cost reductions in solar energy generation and storage,” Kevin Lyon, chairman at NESF, said at the time. This was then followed up by the firm in June last year when it said it was gearing up for the “next stage of growth” of UK solar by investigating the potential of storage retrofits on existing sites.